Last spring, I was in a foul mood. I’d been working like a maniac to get I Heart London finished, my family was dealing with some pretty heavy issues and my love life was appalling. As in, I couldn’t stop hoping the guy I’d been seeing would stop banging a hot, twenty-five year old blonde art student and suddenly realise I was the one. Yes, I am that pathetic. Or at least I was. Just when I was considering a drastic hair colour change and/or murder one, Fabulous magazine asked me to interview self-help guru, Gabrielle Bernstein. At the time, I thought it was a hilarious coincidence, now I’m not so sure. Without rehashing the entire feature (you can read it here), it became very apparent, very quickly that regardless of how cynical I’d been walking into Gabby’s apartment, walking back out again, I felt a thousand times better than I had in months. Through her teachings, her lectures and quite frankly, just through her well-shod presence, I felt in control of myself and my life – or at least I understood what I could and couldn’t control – for the first time in ages and most importantly, I was happy. Legitimately, walking down the street with a skip in my step, chipper. 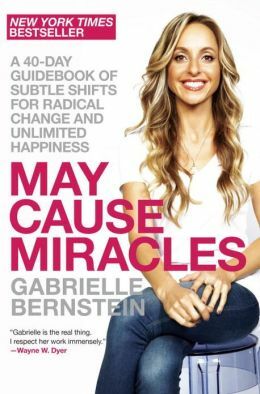 Gabby’s new book is called ‘May Cause Miracles’ and putting a smile on my face last year was a bloody miracle. I took her teachings, I worked on what I needed to work on and within a month, the things I’d wanted to change about myself, were changing. I wasn’t hung up on a man who wasn’t right for me but I wasn’t angry with him either. Now we’re actually friends. I couldn’t change what was happening with my family but I could stop being angry (there’s a theme here) and forgive the people who needed forgiving and support and love those who needed me. There wasn’t really anything that needed changing work-wise, I just needed to get used to the idea that the books were happening and that people loved them and I didn’t need to feel guilty. Weird, right? And um, after a little bit of meditation and confidence building, my sexless love life soon perked up. And up. And up. Now, whenever I find myself spiraling I have the tools to take ten minutes out, work out what’s actually going on and, if nothing else, try to breathe. When is your next book in i heart series coming out? Found you from a link on Living Thoreauly’s blog… you are hysterical. So glad to have seen this post, and funny, because I always hope someday I’ll meet Gabby. She rocks. Looking forward to following you further. 🙂 Cheers, Sarah.